The new anime adaptation Sengoku Basara: Judge End (also known as Sengoku Basara -Judgement-) will apparently be airing sooner than I'd thought - the official website has now updated to confirm that the broadcast will begin this July! There's not much more news to found on the site (they added a picture of the promotional mug that was available back in March). However, Mantanweb has posted a report from a press event held today in Japan. The four previously-announced seiyuu were present and as usual they all had some comments to make: Nakai Kazuya (Date Masamune) confirmed that they've already recorded up to the second episode, Hoshi Souichirou (Sanada Yukimura) is pleased that Yukimura is one of the main characters again, Ookawa Tooru (Tokugawa Ieyasu) described it as having a tense - but fun - atmosphere and Seki Tomokazu (Ishida Mitsunari) implied that the pacing of the anime will accommodate quite a few cliffhangers - like a shounen manga. They don't have much time left to promote the new series so let's hope for lots of news soon! The details should be cleared up a little better next week once the newest Sengoku Basara Magazine has been released. Edit 22/05/2014 22:15: Dengeki Online now has the event coverage online too and there are a few more tidbits. Among other things, the anime's subtitle 'Judge End' was explained; while the meaning of 'judge' is quite clear the 'end' is supposed to evoke the Japanese word shuen, which has a deeper feeling of finality to it than 'end' on its own. It all sounds rather dark, though the article is careful to point out that it might mean that something is resolved once and for all (rather than that a character is going to die). 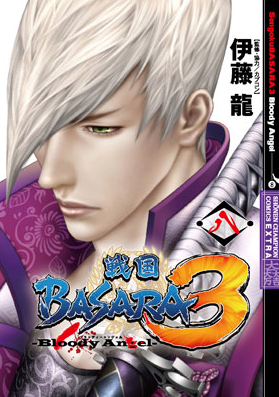 Hoshi observed that anime-only viewers will see a different side of 'Basara' since the plot is based on Sengoku Basara 3 this time. Ookawa said that the story is based on Ieyasu being the one who defeated Hideyoshi this time and teased that people should look forward to what kind of 'Judge End' there will be at the conclusion. Edit 23/05/2014 08:00: And now 4Gamer has posted even more details. KobaP explained that the anime's subtitle would be correctly rendered 'End of Judgment' in English; they made up the abbreviated phrase 'Judge End' as it's shorter and 'Sengoku Basara-like'. He also confirmed that a number of additional characters would be appearing in the anime (Nakai supported this in a later comment). Hoshi said that there were still things even he didn't know about the story's conclusion and whether it would match the game or go with an anime-original ending, while Seki said the thirty-minute episodes would fly by in an instant with Sengoku Basara's trademark flashiness. Edit 23/05/2014 23:30: I should have waited before reporting since Famitsu and Gamer have now added their coverage, and of course, both contain a little more information. All four of the leads are said to be facing up to their respective 'Judge Ends'. Also, KobaP wants to give this version of Ieyasu a more human side as seen in the recent Butai Sengoku Basara 3: Togakuruwashi Kizuna stage play which just ended its run. Hoshi's longer responses in Famitsu's article were very cute, and the stories about the rough times they share during recording sessions are always fun (Ookawa: "It's tough to talk about this without mentioning the names of the other cast members!"). Nakai participated in voicing some of the background characters in crowd scenes this time, so that's something else to look out for. Series director Yamamoto Makoto asked the seiyuu a question during the event: "Which warrior would you personally like to have as a subordinate, or form an alliance with?" Nakai: "I might choose Sarutobi Sasuke. He's dependable, and someone with whom you could discuss your true thoughts without feeling tense." Hoshi: "For me, it's Masamune! Wouldn't it be incredible for Masamune to actually be beneath someone else (*laughs*)? Strong and reliable; if things go well I might be able to achieve unification by saying "Subdue this land!" (*laughs*)." Ookawa: "I don't want to form an alliance with Mitsunari. Being around that guy would probably cause trouble (*laugh*)! Rather than an alliance, I'd like to become friends with Keiji. He might take me to a few fun places." Seki: "The one I want to have as a subordinate is Capcom's YamamotoD. Asking a question at a time like this! The one I'd want to ally with is KobaP; maybe he'd give me steady work for a while (*laugh*)." They were then asked whether there were any roles they'd like to play other than their own characters. Nakai: "If possible, a character who is less tiring and doesn't burn so many calories would be good (*laughs*). Someone like Oichi or Sasuke?" Hoshi: "I'd like to gain Nakai-san's voice and play Masamune. Isn't it cool?" Ookawa: "A character I definitely wouldn't usually play; so perhaps Saika Magoichi. She's cool and also powerful, in the games." Seki: "I want to play Tsuruhime - with Nakai-san's voice." Nakai: "You too!? (*laughs*) Why Tsuruhime?!" Seki: "Um, because I want to humiliate Nakai-san's voice? (*laughs*)"
KobaP reportedly ended by saying that more information might be coming out around the 10th June. That's when the big monthly anime magazines go on sale so it would make sense for the next batch of announcements to appear then. Please be advised that all of the reports have phrased things slightly differently and then this summary is my own interpretation of their words. No matter how the anime turns out, I feel excited already seeing how seriously the voice cast is taking it! It looks as though Empty will be adding Chara-Forme figures of Tokugawa Ieyasu and Ishida Mitsunari to its range in the future. I love the way that their Hoozuki figure looks so I'll definitely be snapping both of the Sengoku Basara models up when the time comes. There aren't many details yet aside from that snapshot of the concept artwork for Ieyasu, the artist details and the price (¥3,500). Capcom's official store has been updated with the cover illustration for the eighth and final volume of Itou Ryuu's gloomy Sengoku Basara 3 Bloody Angel manga. It fits well with the rest of the books in the series. As expected, the Dais shop has updated with the leftover merchandise from the recent stage play. The DVD can also be ordered at the same time; it will come in the usual ¥6,700 special edition (with photo booklet) and ¥6,200 standard edition formats. The DVDs will ship at the end of September 2014. Fans who don't have the ability to order through Dais can expect preorders to appear in regular stores shortly too. The book can be ordered from all good bookstores like Amazon Japan (Kindle link). Thanks to their top 100 list for games sold between 1st April 2013 and 30th March 2014, Dengeki have given us a glimpse into how Sengoku Basara 4 has been performing since its release on 23rd January. Ranking at a very respectable 40th place, the total sales are listed as 234,487 copies. I'm not sure exactly how the figure was calculated and it's important to note that download sales are not included in the totals. If we compare with the wildly varying first week sales figures (Dengeki's own chart reported 167,089 copies at the time), it seems that the game has continued to sell gradually. It's such a shame that download copies aren't counted too to give a better picture of how well each title is doing. So what is the actual title of this anime? How confusing! It's a surprise how soon it will be broadcasted, I thought it would be during autumn perhaps. There seems to be a rush in making more SB stuff. As a fan I just want them to take the time needed to make something good but I guess there is an economical motivation hurrying them. But yes the VA's seem enthusiastic. "a character who is less tiring and doesn't burn so many calories would be good"
Keeping track will become even more fun if FUNimation licenses it for English-speaking regions and gives it a new title like Sengoku Basara: Samurai Judgement. Or something like that. Well I don't care that much what they call it as long as there will be an English release too. I also can't wait for next year's celebration of Sengoku Basara's 10th anniversary. They have to have a ton of things on. The anniversary is going to be great!